This trip had a been very last minute yet I’d still managed to get decent flights really. 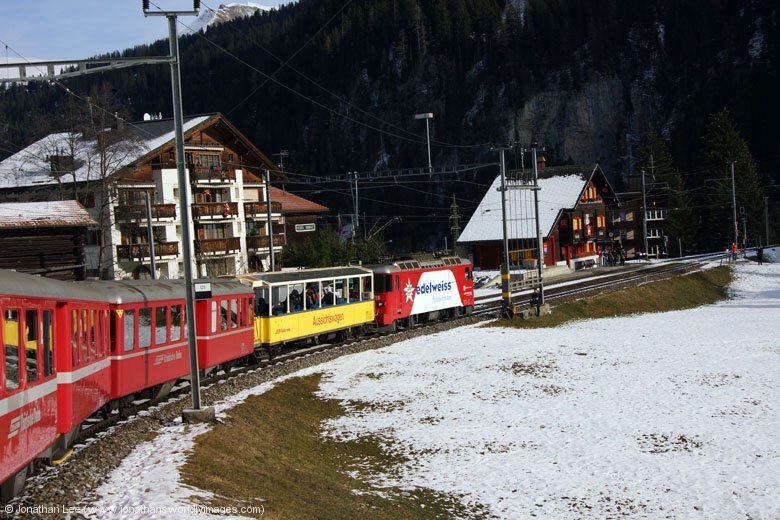 The only reason for the trip was to cover the RhB’s 100th anniversary of the Chur to Arosa line; for which a special timetable had been put together and issued about 3 weeks before the event. Unfortunately the train formations indicated on the RhB issued documentation didn’t give any clues as to what would be working, other than the trains would be loco-hauled. With this as my prime objective I set off, with little else planned but loads of ideas in my head as to what to do. The issue surrounding everything was that it was the European timetable change during the weekend I was there and we all know what comes with that; loco diagram changes, and sometimes for the worst! Chur – Hotel Chur (Welschdörfli 2, 7000 Chur, Switzerland) – CHF274 for a single room for 3 nights – My regular hotel when in Chur, only a 7 minute walk up the road from the station if you follow the Arosa line train tracks through the street you won’t miss it on the right. This stay was no different to any other, the single rooms are small and cosy but have decent sized bathrooms with piping hot water. The free WiFi throughout the hotel worked a treat in my room as well. Breakfast is included in the room rate. An early start, having stayed in Ladywell the night before. The walk through the deserted streets at 0445 was a little grim in the morning rain and when I got to Lewisham Docklands station the departure screen wasn’t showing what I’d expected. Journey planner showed the first train to be out of Lewisham at 0508 but the screens indicated it to be at 0518; this was the case right up to 0506, when a train arrived and was turned straight round to depart at 0508. Only then were the screens updated. Bizarrely the online live departures for DLR had showed what the platform screens had displayed but itself altered at the last moment; still I was City Airport bound at the time I’d expected and arrived there at 0553, after the planned change at Westferry, with 1h07m to my booked plan departure time. Getting through to departures at City airport is a breeze and it took me 9 minutes from Docklands to departures so I had plenty of time to relax before my flight; which didn’t get a gate advertised until 0635 anyway. Boarding was prompt and we were even off stand early; BA excelled themselves with a full English breakfast being served on the 1h20m flight to Zurich, and very good it was too. Unfortunately at Zurich we parked away from the main stand and after a bus journey to the main terminal and a very long walk through it to get to immigration, I was finally exiting the airport at 0935. Mustn’t grumble though as we weren’t booked to land until 0930! 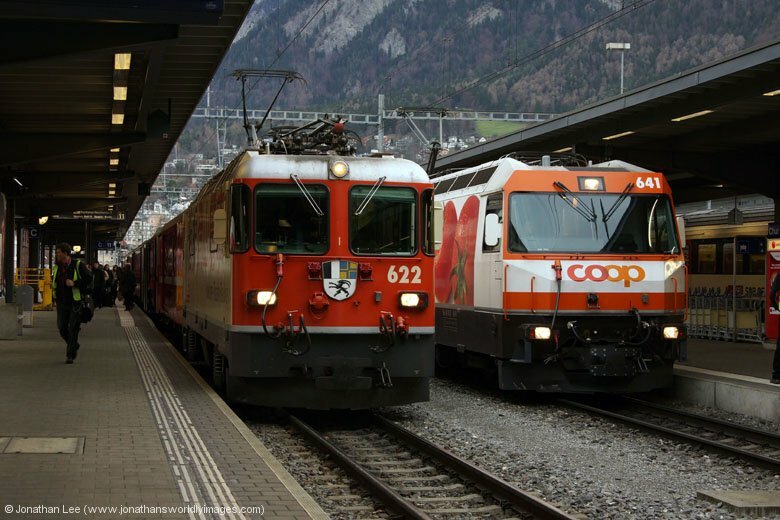 I’d decided in my head during the flight that I’d spend the morning playing the Voralpen Roulette as SBB Cargo 421384 had been reported as currently on hire while modifications were carried out to the EMU power cars. With there being no reported sightings for a couple of weeks though I was a little skeptical as to whether it would still be out but as I’d only had one of SOB’s Re446’s there was still something to go at even if it wasn’t out; assuming any of those were out of course! Having done 460060 to Zurich Oerlikon on IR2325 0947 Zurich Flughafen – Luzern I ended up waiting there for 18237 1006 Zurich Flughafen – Ziegelbrucke forward to Pfaffikon as there hadn’t been anything else worth doing turn up in the meantime. Oerlikon was hard work too as there’s ongoing building works and you can’t see across all the platforms so have to go onto the platform you need to be on to spot anything coming in. At Pfaffikon the even hours Voralpen Express departure towards Luzern doesn’t go off the same platform as the St Gallen bound Voralpen Express that departs shortly before it so you can see if both trains are loco-hauled on the departure screens for the respective platforms, at the same time; an hour later and I’d have to wait for the St Gallen bound one to depart from platform 2 before the Luzern bound one was displayed on the same screen. 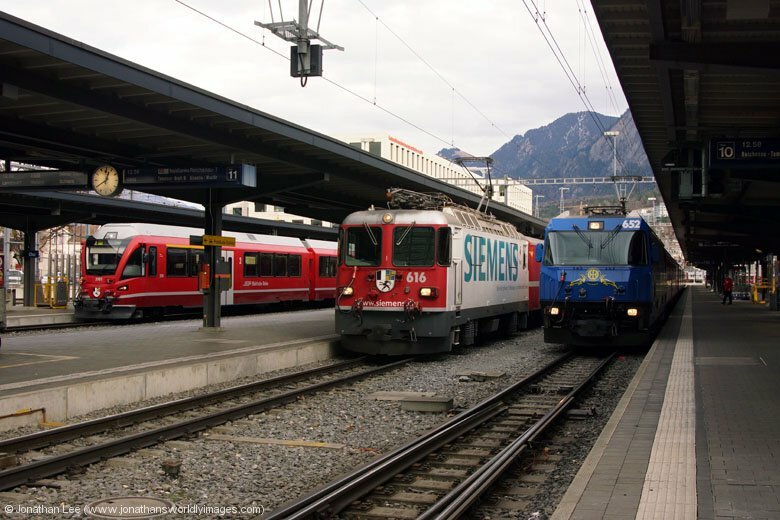 The screens indicated that VAE2419 0940 Luzern – St Gallen was EMU and VAE2414 1005 St Gallen – Luzern was loco-hauled; they were of course correct and 561084/081 departed with the former and Re456’s 456093/095 departed with the latter. During the hour I ended up with at Pfaffikon there was plenty to see with SBB Cargo Re4/4’s 11289, 11254 & Re6/6 620042 all heading through with only short freights and dead on the rear of 11289’s train was SBB Cargo’s 843064. 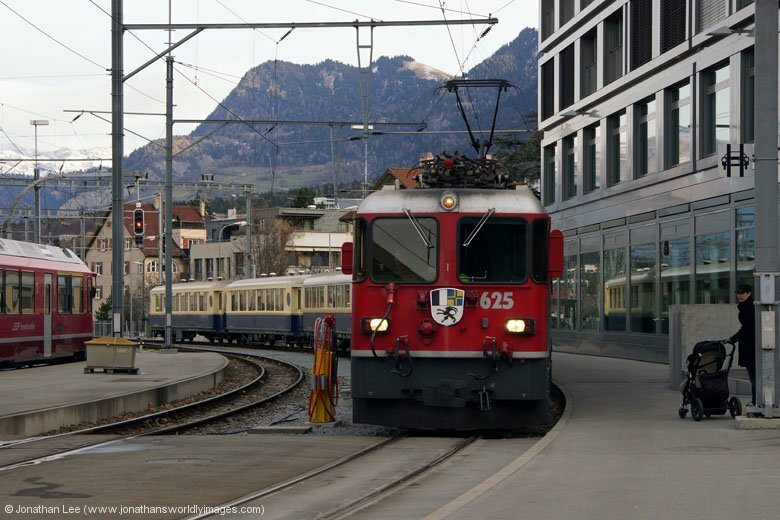 Also passing through other than the usual Re460’s, was SBB Re4/4 11153 with IC10770 1038 Chur – Zurich HB. Photting stint over the screen on platform 2 indicated that VAE2421 1040 Luzern – St Gallen was loco-hauled and when it arrived with SOB’s Re446’s 446018/016 I pondered things for a moment. 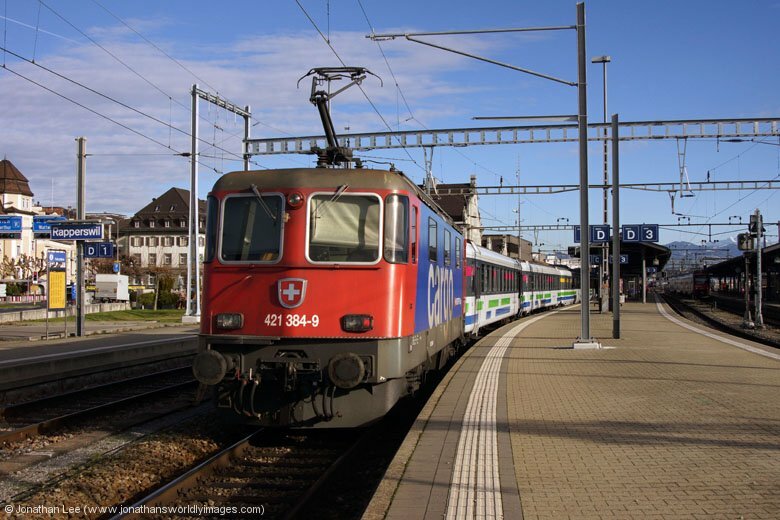 I needed them both but in doing them to Rapperswil I ran the risk of missing the opposing working as the trains crossed there. 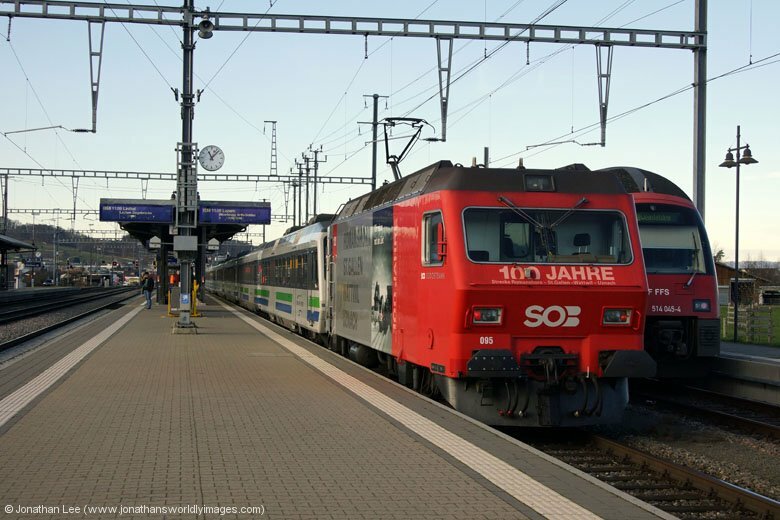 Less than 10 minutes later and after a mad dash at Rapperswil I was headin back towards Pfaffikon on VAE2416 1105 St Gallen – Luzern with SOB Re456’s 456092/094. With 4 out of the five turns now viewed I had in the back of my mind that the last turn could well turn out to be anything but 421384 so I decided to run the risk of heading towards Arth Goldau and crossing the last turn at Rothenthurm. I’d almost come a cropper there before when I rolled in from the Arth Goldau direction to find 11317 already in and waiting to depart earlier in the year. 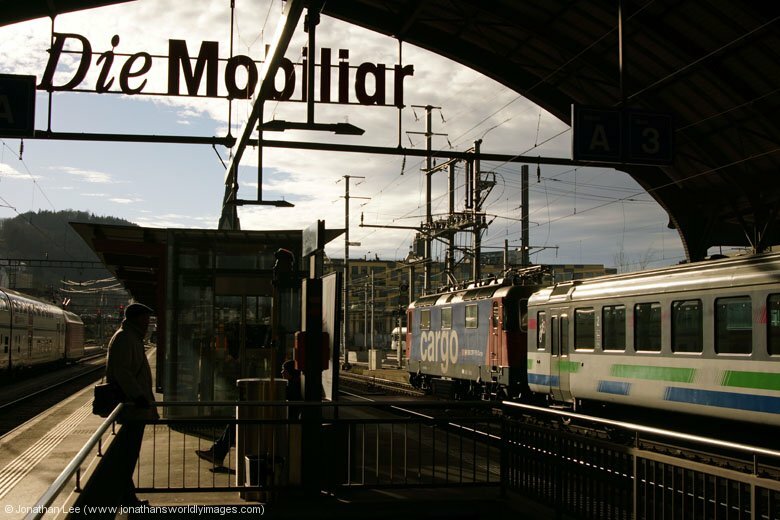 On that occasion I’d been saved by the fact the guard on the platform had seen me gesturing to him that I wanted to be on his train; fortunately on this occasion we were into Rothenthurm first and sat waiting VAE2423 to arrive. 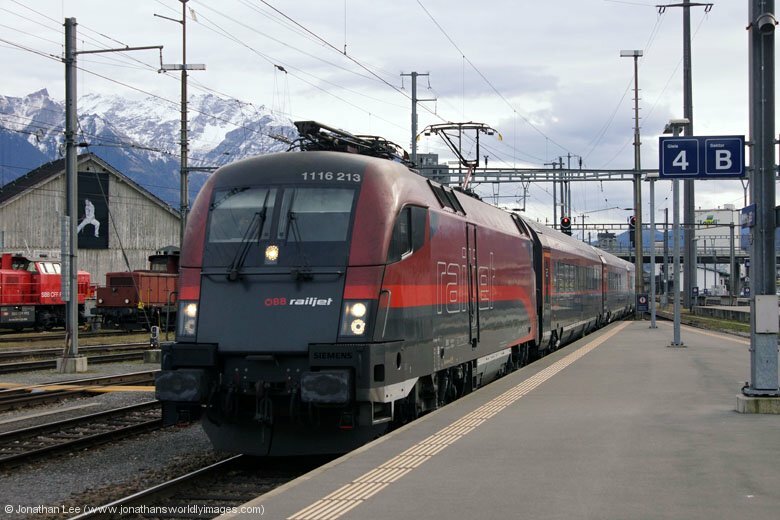 This move made sense based on the fact that if VAE2423 was no good I could continue to Arth Goldau and do the booked Re4/4 turn into Zurich on IR2272 1047 Locarno – Zurich HB. 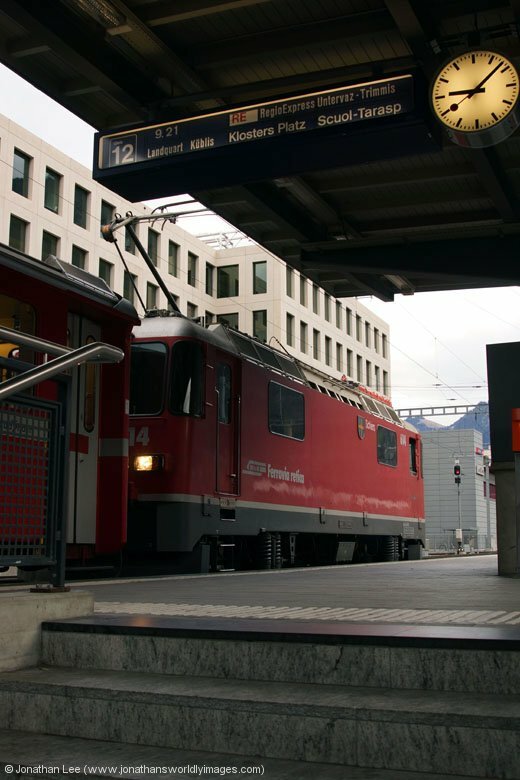 I wasn’t in the best of places when VAE2423 arrived into the opposite side of the island platform and being at the rear of the Luzern bound train made it hard to see what was actually on the rear of the St Gallen bound train. SOB Re446, 446015, was at the head of the train but I couldn’t quite make out what was at the rear, the sun glinting off the side of the loco not helping; either way though I was sure I could make out small glass panels on the side of the loco and that coupled with the fact that 446015 had been the usual SOB culprit that worked with the SBB Cargo locos I exited one train and joined the other. My suspicions were confirmed when VAE2423 departed and rounded the first curve; the loco on the rear of the train was in SBB Cargo livery. The St Gallen bound trains sit at Rapperswil for a few minutes and there was plenty of time to both confirm that the loco on the rear was 421384 and to get some decent photos of it before it continued its journey, with me on board. During the summer the SBB Cargo loco’s hadn’t managed to turn up on the right diagram for me to get to St Gallen and I took the opportunity this time to make sure I went through to St Gallen with the correct traction as I might not get the chance to do so again; the photos of 421384 in the afternoon sun at St Gallen being as good as those at Rapperswil. 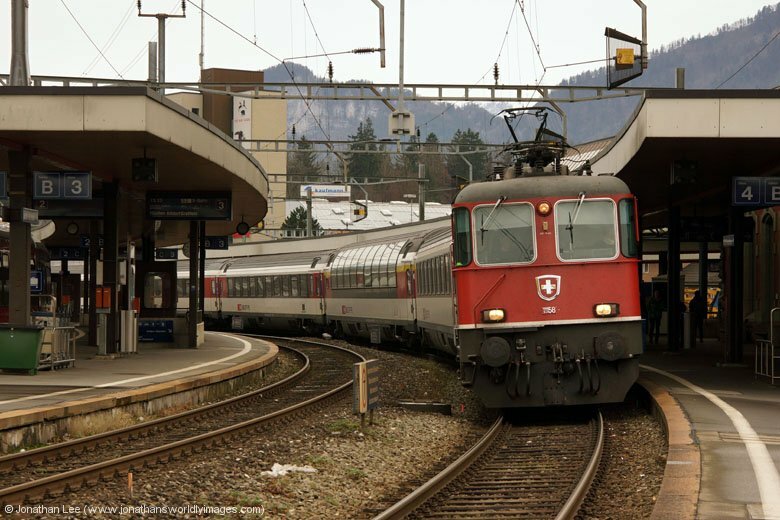 460005 was the engine on IC728 1411 St Gallen – Geneva, the aim now being to get back into Zurich for the afternoon rush hour trains. Having got off at Winterthur there were a couple of choices to get back into Zurich, the first to roll in was good enough for me with IC830 1441 Romanshorn – Brig having 460053 at its helm. Upon arrival at Zurich I knew what I had to view but soon came across three trains, almost all at once, which weren’t booked for SBB Re4/4’s but had them all the same; IC780 1600 Zurich – Basel had 11129 at its helm and IC10778 1438 Chur – Zurich arrived with 11134, no sooner had it arrived did 11126 drop on to work IC10777 1607 Zurich – Chur straight back with the same stock. Unfortunately I couldn’t find the diagrams in the Re460 turns to see what 11134 should go back with but suspected it might be the 1807 Zurich – Chur so planned to view it later. 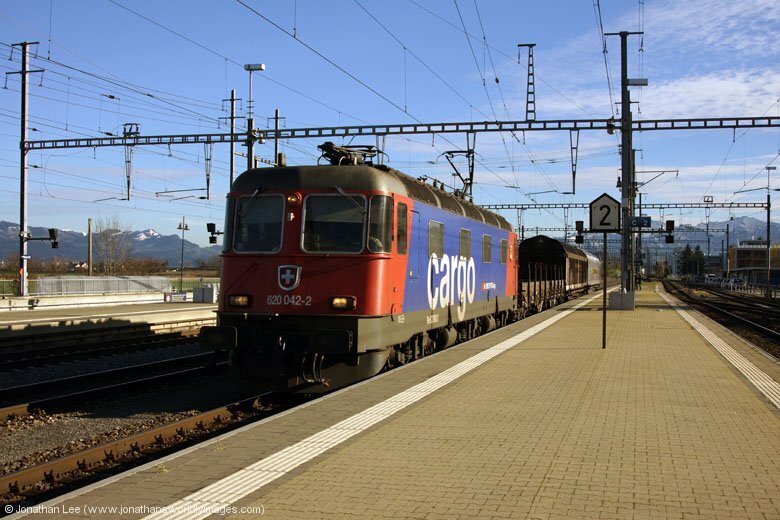 Meanwhile what I thought at the time to be an SBB Cargo loco, 11181 dropped onto the stock for IR2279 1609 Zurich – Locarno so I did that out to Zug. 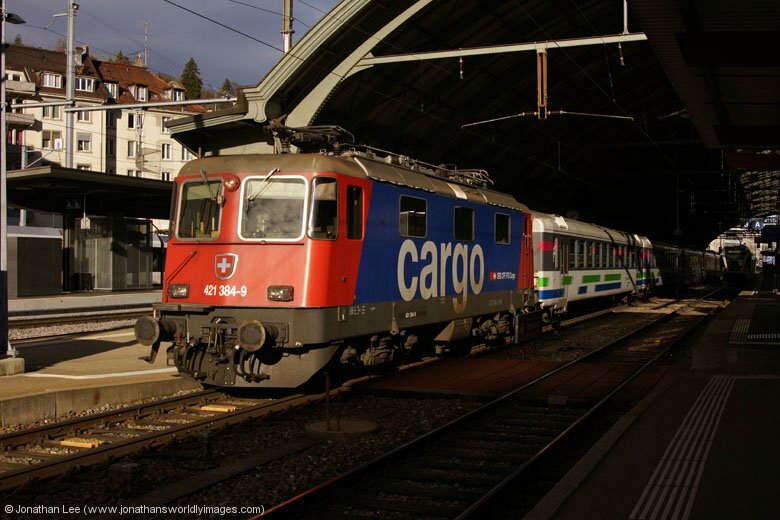 I’d got mixed up in my head and discovered later that I’d been thinking about 11180 when 11181 presented itself; 11180 having been the SBB Cargo hire loco on the Voralpen Express trains earlier in the year….. I didn’t make the plus 1 at Zug onto the return IR to Zurich, which I never seem to do, so had a 30 minute wait to get back into Zurich. Rather than fester I spotted a new Re450 in the triple set that formed 18969 1638 Zug – Uster and did it out to Steinhausen Rigiblic, it being a small plus for another straight back in and a plus 7 or so for the train I’d have festered for at Zug anyway back into Zurich. With only one of the five Re450’s of the move being new it seemed like even Re450’s might be slim pickings for me on this trip; having done the Zurich rush hour to death a few times earlier in the year! 460068 was on IR2358 1635 Luzern – Zurich HB and delivered me back just in time to find SBB RE4/4’s 11124/11127 waiting to depart with IR3831 1733 Zurich HB – St Gallen. Little did I realise at that point that they would be the last pair of Re4/4’s to work the train as the timetable change over the weekend would bring about a diagram change for the train, along with a train number change also. As I didn’t need either of the pair on IR3831 I hurried downstairs to platform 31 to find 11300 just being detached from the Zurich end of the set that would form IR3837 1742 Zurich HB – Luzern, which had 11158 at the business end. With this also being no good to me I headed back upstairs to see what would work the 1807 to Chur; hoping my suspicions about 11134 would be right and getting myself to Chur quite early in the process. I was hopelessly wrong and IC10785 1807 Zurich HB – Chur was formed of a push-pull set with 460067, which arrived ex IC10782 1638 Chur – Zurich HB and was turned straight round. 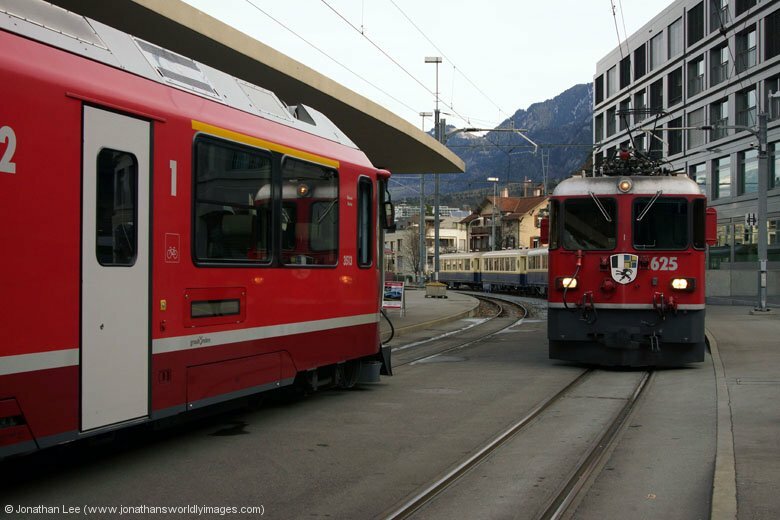 Hoorah for Re4/4 11304 arriving with a push-pull commuter set on IR2280 1447 Locarno – Zurich HB and being turned straight round for IR2283 1809 Zurich HB – Chiasso with the same push-pull set. As it turns out all I had to do was wait another half an hour at Zug and I could have had 11304 back in instead of 460068, which ironically I had back from Zug to Zurich again off 11304’s train, it having been to Luzern and back in the meantime! I was ready for my bed as I headed out of Zurich, thankfully having fed myself from the Migros takeaway downstairs at Zurich HB. At least it was a new Re460 on IC587 1833 Chur – Basel, 460055, and a relaxing journey it was too on a relatively empty and quiet train. The Hotel Chur had been expecting me and I’d advised them of my expected arrival time as my previous visit had resulted in me having to get a local to ring the number on the hotel door as the place had been locked up for the night! No such issues on this occasion and I was checked in quickly; once a girl in the reception area had found someone to man the reception. The hotel didn’t seem to be anywhere near full and in fact seemed pretty empty. My room was on the second floor, right by the lifts, which I thought might be a problem as regards noise but wasn’t at all. The room itself was quite pokey but didn’t really need to be large and had a single bed. The heating worked very well and the water in the bathroom was piping hot. The free hotel WiFi worked very well in my room. Having been up very early I was ready for my bed the moment I walk into the room and didn’t waste much time in getting my bag sorted for a quick getaway the following morning. Unfortunately though I managed to blow my travel plug up when I plugged it in and left myself with no way of charging anything via the mains for the next three days. 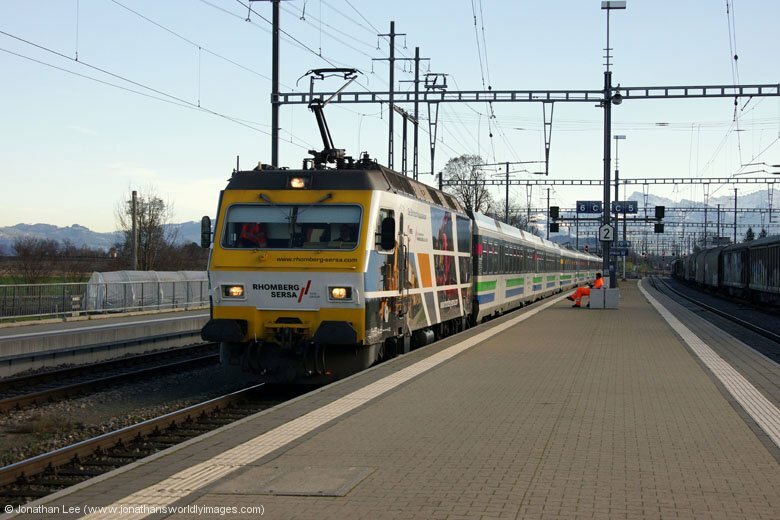 Luckily my travel charger was fully charged and hopefully I’d only need to charge my phone so I wasn’t overly concerned when I went to bed that night…..
11304 Zurich HB Zug 1809 Zurich HB – Chiasso IR2283 SBB Re4/4 on push-pull commuter set! My early morning the previous day prompted a lay in but by 0700 I was up and about and ready for breakfast. After a decent breakfast I headed out to the station, with a good pack-up assortment bagged up at breakfast, to keep me going for the day. I hadn’t really planned to be out and about so early so just decided on seeing what was out on the Chur – Zurich services and maybe having a spin before the first Extrazug of the day on the Arosa lie at 0935. 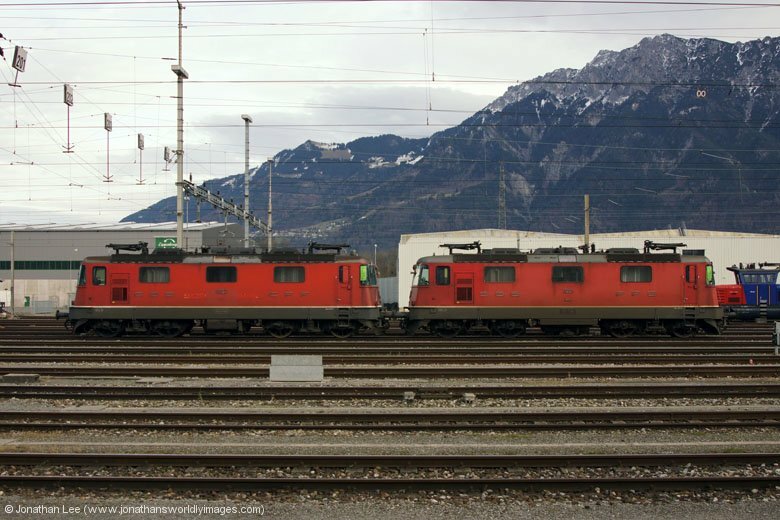 Best laid thoughts soon went by the wayside when I found RhB Ge4/4 II #613 & Ge4/4 III #651 side by side waiting departure with RE1212 0717 Landquart – Disentis and RE1121 0758 Chur – St Moritz respectively; both of which were required. 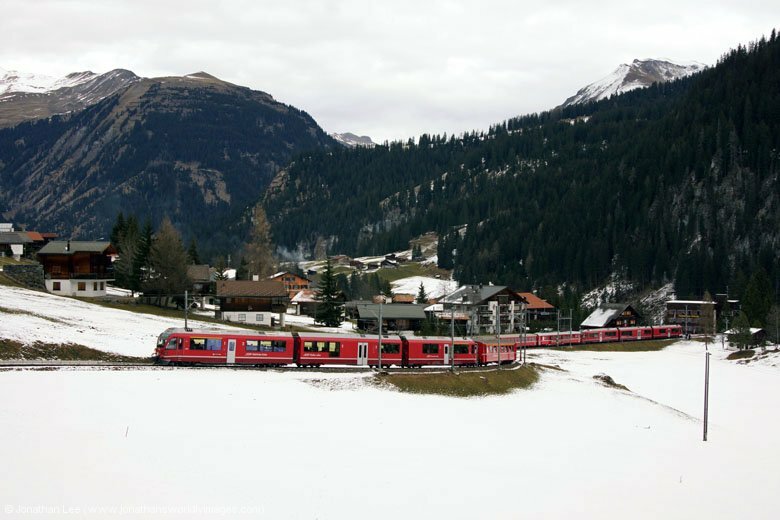 I only just made it underneath and onto 613’s train before it departed at 0756 and hatched the only plan available to get both in, en-route to Reichenau Tamins, where I got off and did 651 forward to Thusis for the cross platform plus 5 onto IR1120 0702 St Moritz – Chur, which arrived with yet another required Ge4/4 III #642; the morning getting off to a good start indeed. Back at Chur it was time to see what was going on at the main event and having spotted RhB Ge6/6 II #701 on Chur shed that morning, alongside the two sets of stock that would work the Arosa line, I was hoping for something decent to be out; maybe even including some if the heritage fleet. 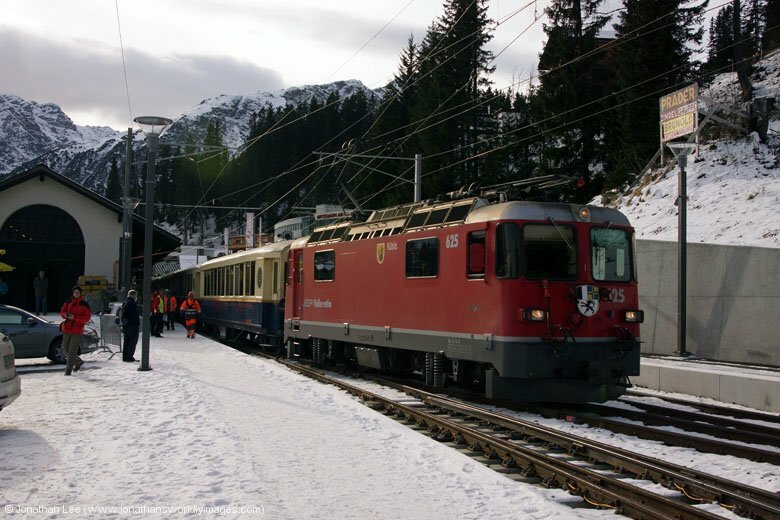 I was sorely disappointed when I got out to the Arosa line platforms at the front of the station to find Ge4/4 II #618 sat at the end of the platform waiting to enter with the stock for the 0935 “Edelweiss Express” to Arosa. 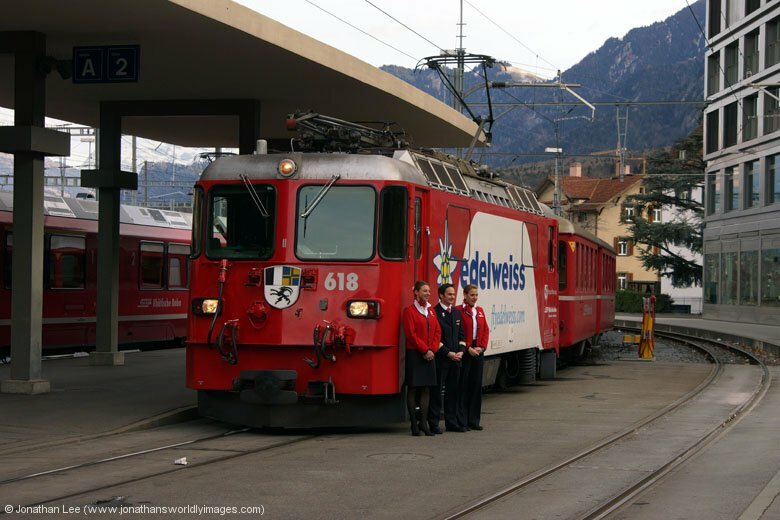 It did however make sense that 618 be rostered for this set as it was painted in Edelweiss livery and on board the train were two Edelweiss airlines stewardesses going up and down with a trolley, giving away free snacks. Anyone using the open air car at the rear of the train must have been made though, it wasn’t very warm at all and only about 5 degrees above freezing until the sun managed to peak over the mountains! I decided to flag 618 and wait for the Alpine Classic Pullman behind, on the 1020 Extrazug to Arosa, hoping for better traction but was equally as disappointed when RhB turned out Ge4/4 II #625 for the job. It seemed that RhB had neglected to understand the significance of the event and leave their heritage fleet, one of which, #353, was of course 100 years old itself during 2014, behind closed doors! I’d expected there to be some sort of surcharge to travel on the RhB Pullman set, as they did when it was used in the summer, but it was a free for all and a bit of a scrum to get on when 625 drew the set in a mere 4 minutes before departure time. I thankfully managed to be stood in the right place on the platform and got myself a seat; many others weren’t so lucky and ended up standing all the way to Arosa. Having never done the Arosa line before I didn’t really know what to expect. The line climbs quite steeply but without the need for any cogwheel action. 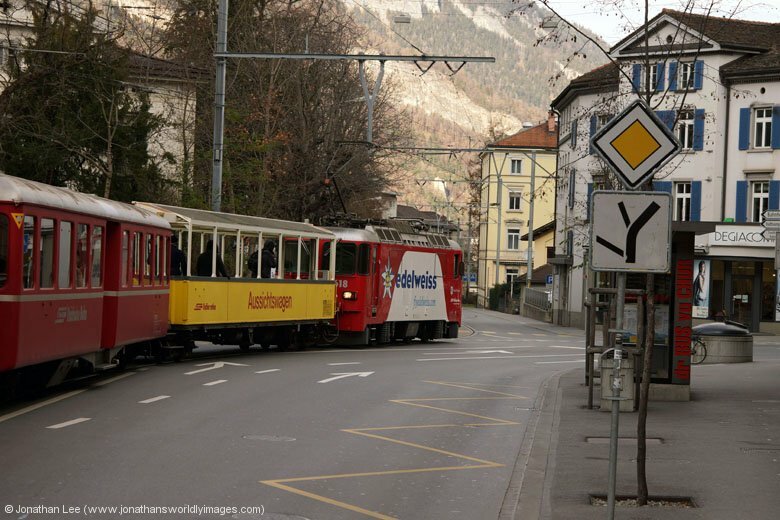 It starts its journey from Chur by running down the middle of the street then turning left by the Chur Hotel and continuing through the street unil the outskirts of town, following the river as it does so. 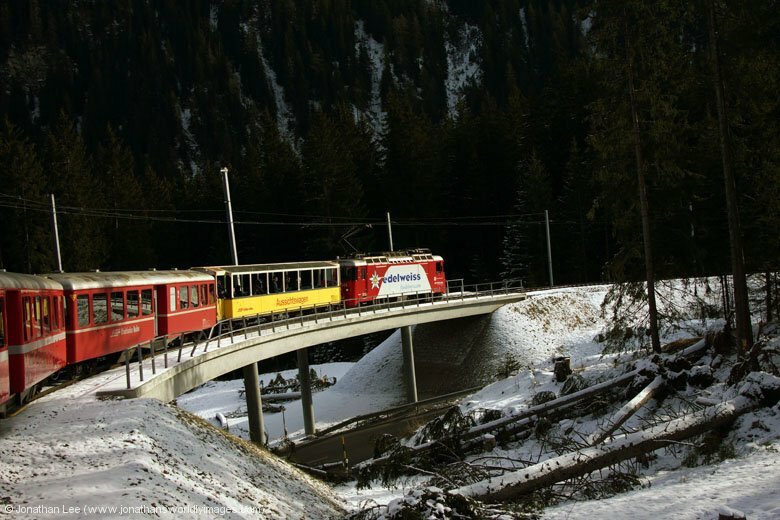 Once by the Chur Stadt carriage and wagon shed the line enters the wilderness and runs under snow protection covers, up steep inclines, round tight curves, clings to the top of sheer cliff faces and over high viaducts as it covers the 26 kilometre journey up to Arosa. 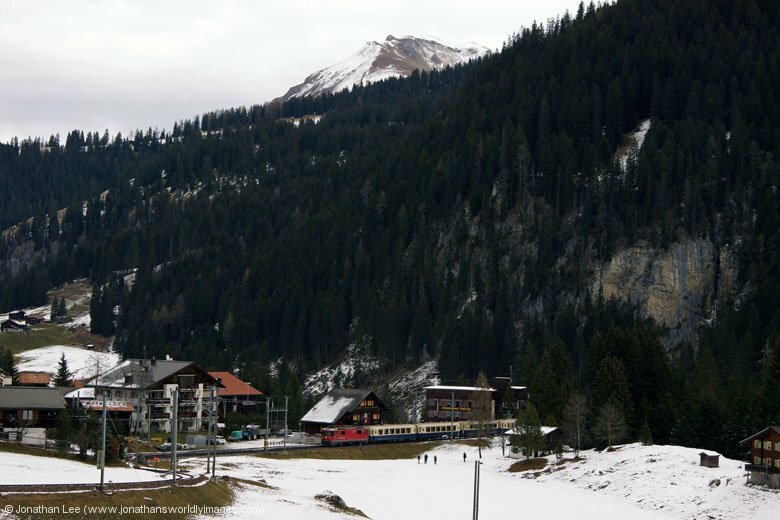 There are fantastic views en-route at Langwies as the train crosses the prominent viaduct there and again at Litziruti, where the snow began to appear; something that by Swiss standards was lacking during December 2014 by all accounts. This was a little unfortunate as the line would have looked like a proper winter wonderland had there been that covering of snow that was usual for this time of year. Despite the wedge factor on the Alpine Classic Pullman it was a good journey and while we were late arriving into Arosa there was no way the plus 9 onto the Edelweiss Express was going to miss going back down to Chur as 618 and set were in the sidings beyond the statin as we arrived and ultimately had to us the same platform we’d arrived on to depart as the 1148 Arosa – Chur was sat in the other platform with an EMU + 4 coaches in tow. A brief scan at the display at Arosa revealed none of the RhB heritage fleet and the only loco present was Ge4/4 #611, along with some different types of coaches and a rotary snow plough in steam. As it didn’t take long to get 625 plus its Alpine Classic Pullman set into the sidings it wasn’t long before 618 plus its Edelweiss Express set were shunted into the platform and departed 9 late as a result of the Pullman arriving late; all this time was picked up by Chur though. It was an almost empty train all the way back to Chur, most people braving the outside in the open air coach whih was now leading back to Chur. The stewardesses on board seemed to be in good spirits and told me they liked the change of scenery, as opposed to the inside of a plane. Unfortunately the fact that we had to slam on to avoid hitting a bus, while entering the section of track that leads down to Chur station by the Chur Hotel, meant I managed to get to the 1238 Chur – Zurich just as the doors had slammed closed in my face; the irony of that being that the following day the train departed a minute later, after the timetable change! 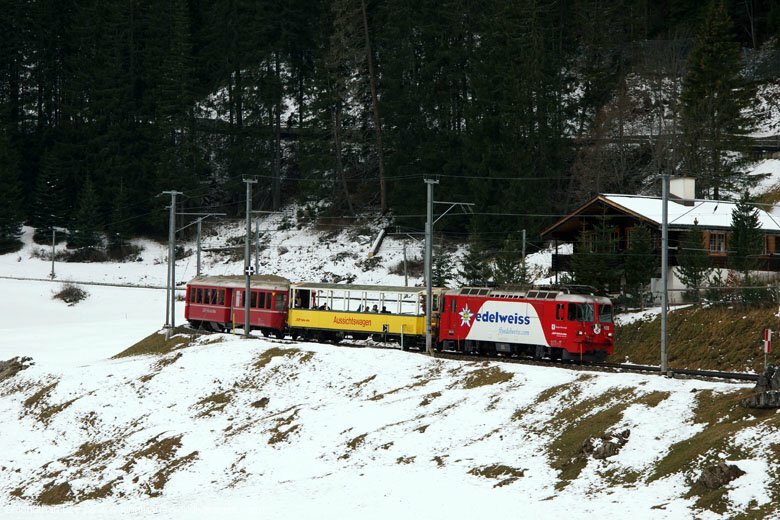 I still had plenty of time to do what I needed though and I ended up on the 1308 Chur – Basel to Landquart, with 460077, instead to view the 1320 Landquart – St Moritz. 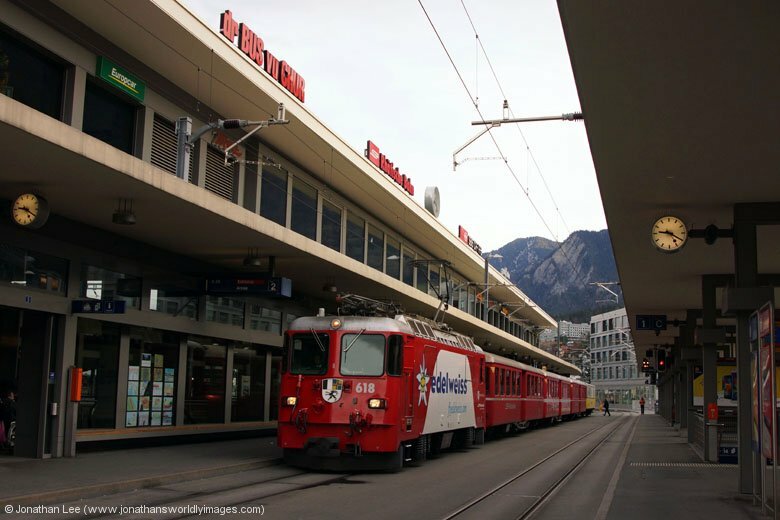 As I was using the RhB timetable I’d had during the summer, which I’d written all the diagram numbers in, I hadn’t even thought to cross reference the diagrams with the Autumn ones but did so later on, once I found an EMU on the 1320 Landquart – St. Moritz! This sort of put a spanner in my move plans but it wasn’t long before something else was on the horizon….. While stood pondering I noticed the old green bench seat stock sat in the middle road between the platforms and amid the chaos an engine looked to be coming off shed to drop onto it. It was only something red but the sun was perfect on the opposite side so I went underneath to get a photo from the opposite platform. When I got there I was very surprised to find Ge4/4 I #610 backing down onto the stock and the photos were perfect. Now for the telling question; what the hell was it doing? My limited German couldn’t extract anything from the folks on the train but thankfully a guy came along and butted into our conversation; this being a guy I recognized as the train manager who’d been on the Pullman set when I’d done it to Scuol-Tarasp during the summer. 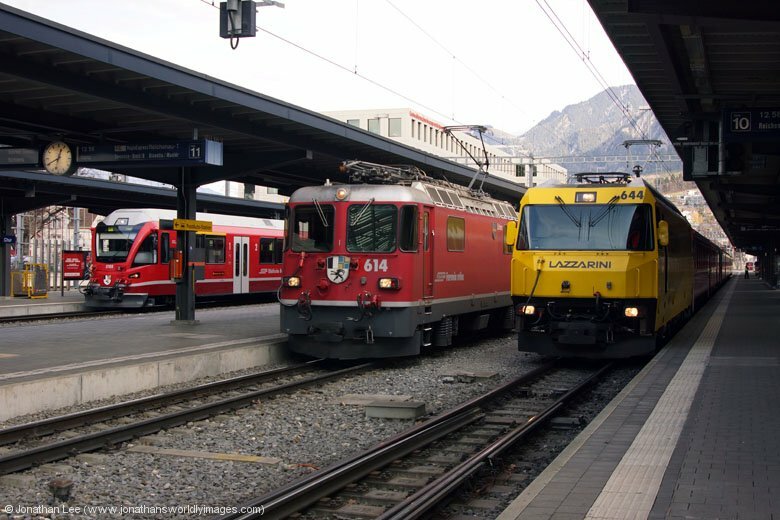 He spoke good English and explained that the set was going to Arosa as a 1435 Chur – Arosa Extra for Children only. While this train wasn’t advertised anywhere for some reason it rang a bell but I couldn’t find reference to it in any of the literature on offer during the day so I must have come across it while searching the internet before the weekend. Either way he reiterated that the train was for children only, which kind of put pay to any idea I may have had of getting on it at Chur. 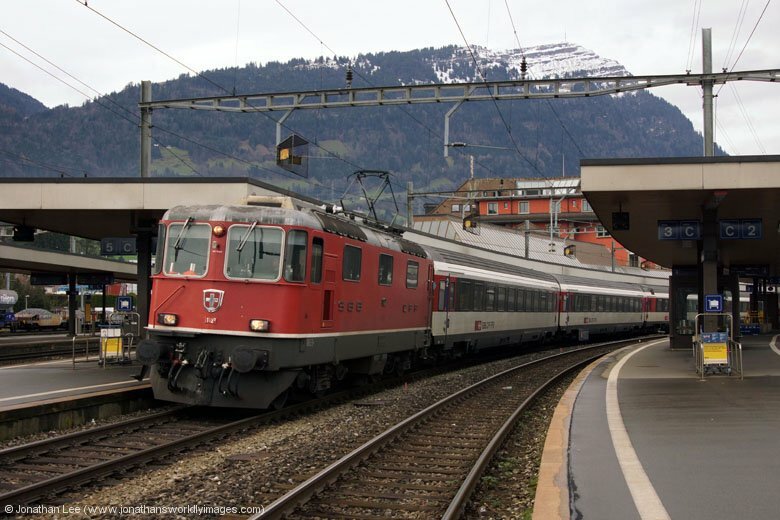 I spent the early afternoon doing what turned out to be less than fruitful moves on the SBB trains between Chur and Sargans and but for Re4/4 11135 turning up with IC10778 1438 Chur – Zurich HB it would have been a bit of a disastrous afternoon really with all the 460’s out on the Chur diagrams being dud ones. I met up with Tohm on board IC575 1437 Zurich HB – Chur, who I’d arranged to meet up with somewhere in the Chur area before setting off from the UK. Tohm was a virgin to RhB and so everything was fair game. While I’d been pottering around during my less than productive afternoon I’d cross referenced the Autumn diagrams with my summer timetable and figured out a few things, one being that by doing RE1253 1344 Disentis – Scuol-Tarasp to Schiers for RE1350 1437 St Moritz – Landquart back we’d cover three of the RhB Ge4/4 II turns that I’d not seen that day. The bonus of the move being that RE1350 was booked a pair of Ge4/4 II’s on a Saturday. 615 produced with RE1253 and after our wait at Schiers I have to say I was quite surprised to find both Ge4/4’s on RE1350 with pan’s up and working; they were consecutively numbered ones too, 621 & 622, the former being a new one for me, taking me down to two left at that point and I had a sneaky suspicion that one of those two, #623, was going to be on the evening Lichtzug on the Arosa line after seeing it paired with #627 and coupled to a set in the sidings, Reichenau side of Chur station earlier in the morning. I wasn’t wrong either as we found said pair waiting to bring the stock into the station at Chur when we got back there from Landquart. Aptly #627 was in Arosa line 100th anniversary livery and #623 was in RhB 125th anniversary livery; quite why they’d not been on display at Arosa though didn’t seem to make much sense as nobody would see them while they were out working at night. The Lichtzug was formed of panoramic coaches with a coach in the idle of the train rigged up with coloured lights. Had there been a blanket of snow covering the area surrounding the Arosa line the lighting display would have been a lot better but as it was some of the lights didn’t seem strong enough to reflect off the dark surroundings. Either way it was an interesting journey, in the pitch black, with the lights out on board the train and only the lighting outside highlighting a few things as we stealthed our way up to Arosa under cover of darkness. 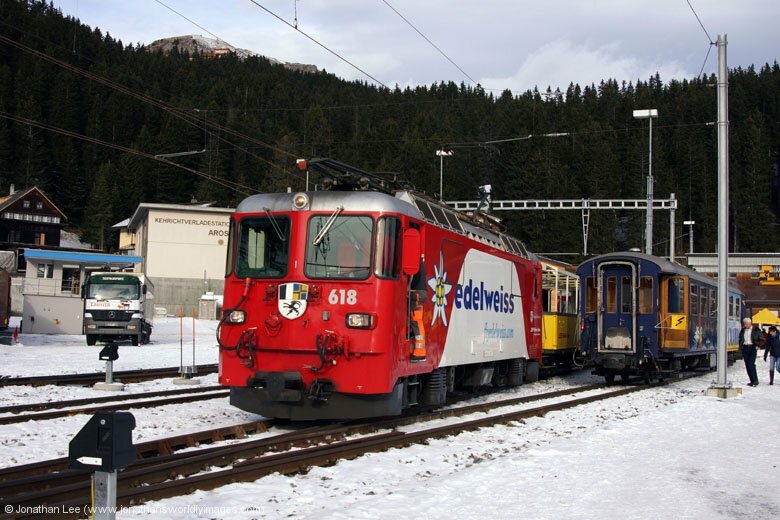 Of course everything that went up to Arosa had to return to Chur and we passed the two expected trains, the Alpine Pullman Express and Edelweiss Express with Ge4/4’s #625 & #618 respectively. 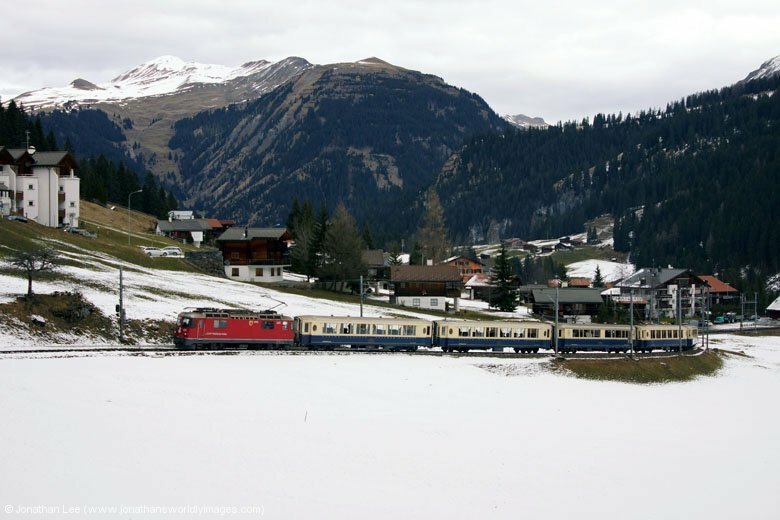 We didn’t pass Ge4/4 I #610 until we were almost at Arosa and when we did do the whole train had its windows misted up, giving the impression that it wasn’t very warm on board at all; it was wedged though yet there were a few adults scattered amongst the children on board. It was a cold night so we didn’t go wondering far at Arosa, mainly to make sure we kept some seats for the return journey. 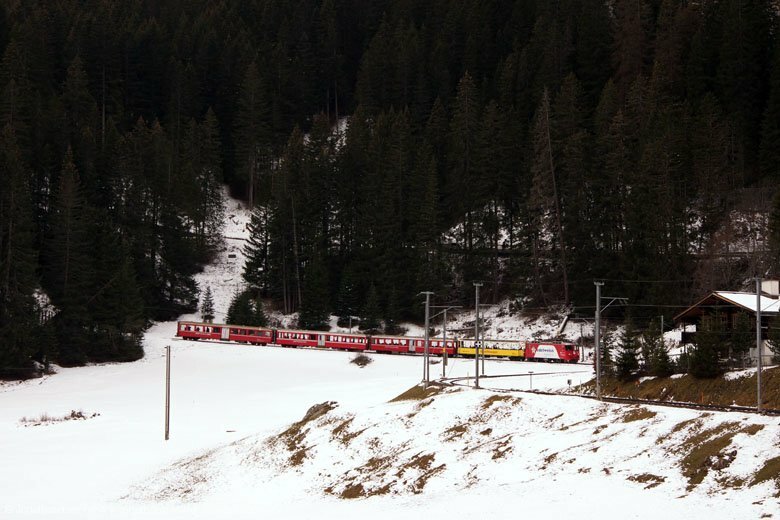 It was a fuller train going back to Chur as quite a few folk had been up to Arosa for the fireworks display at 1800. The Childrens train must have departure shortly after it had finished and everyone else had waited for the Lichtzug as opposed to doing the 1848 service train back to Chur. The cranking day over Tohm went to check in to his hotel and we met up shortly afterwards in the Pizzeria outside the Hotel Chur, where I only just managed to get a table thanks to some other folk clearing off just as I walked in. The food was good, as always, and we hatched a plan for the following day over dinner while discussing the merits of the day. That plan would be to get up and do the same move I’d inadvertently done on this morning; departing Chur on the 0756 bound for Disentis. After a steady breakfast I was on my way to the station, where Tohm was already waiting. 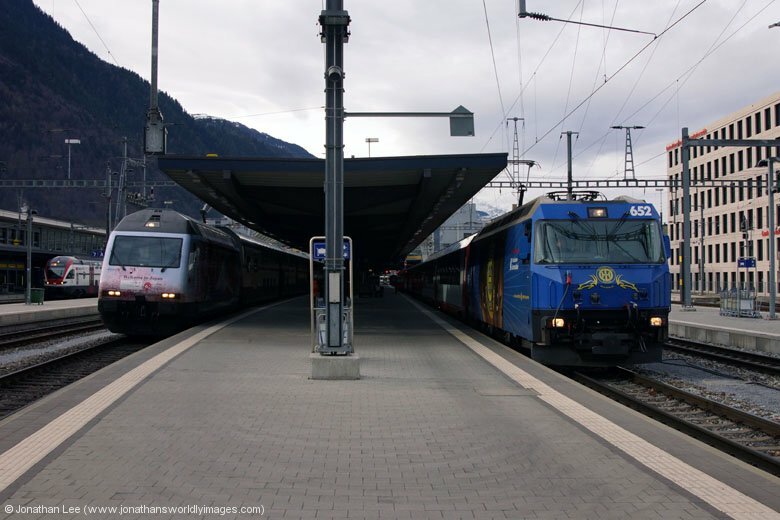 An out of the ordinary sight greeted us on the RhB platforms as Ge4/4 III’s #648 & #642 sat side by side, waiting to depart with RE1212 0717 Landquart – Disentis and RE1121 0758 Chur – St Moritz; the unusual sight of a Ge4/4 III on a Disentis train had me baffled as I’d never seen it happen before. Either RhB really were short of locos for the weekend’s festivities or they were possibly testing 648 on a quick out and back to Disentis? 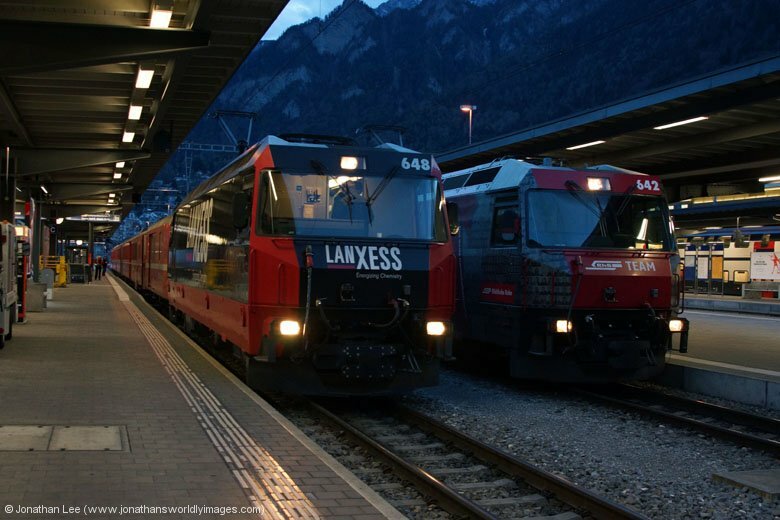 Either way it didn’t make it to Scuol-Tarasp on the next part of the diagram as we saw a Ge4/4 II arrive into Landquart on the same diagram later; we assumed that 648 was swapped out on its return from Disentis. 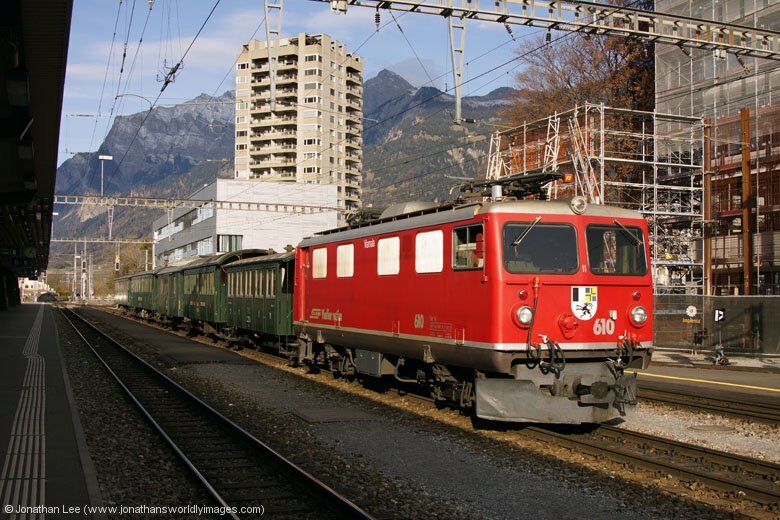 I’d worked out from the previous day’s diagrams that the morning move should have turned out fruitless for me, yet having done 648 to Reichenau-Tamins for 642 forward to Thusis I was surprised to watch 650 roll in with RE1120 0702 St Moritz – Chur; one of my last two Ge4/4 III. By diagram it should have been on the following turn and I’d figured out what I needed to do to get it in that evening; it of course having saved me that job now. 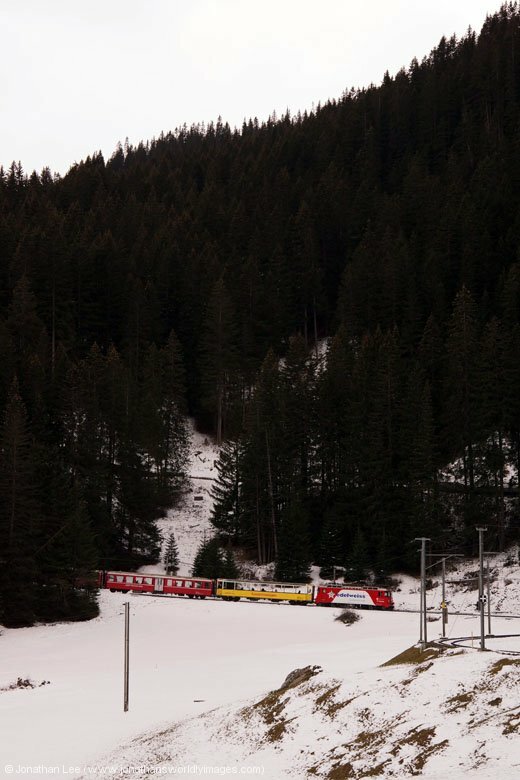 As we approached Reichenau-Tamins we were checked down and just as we came off the St Moritz line we could see the Disentis – Scuol-Tarasp train ahead of us, still sat in the platform; no sooner had we spotted it though did it depart. 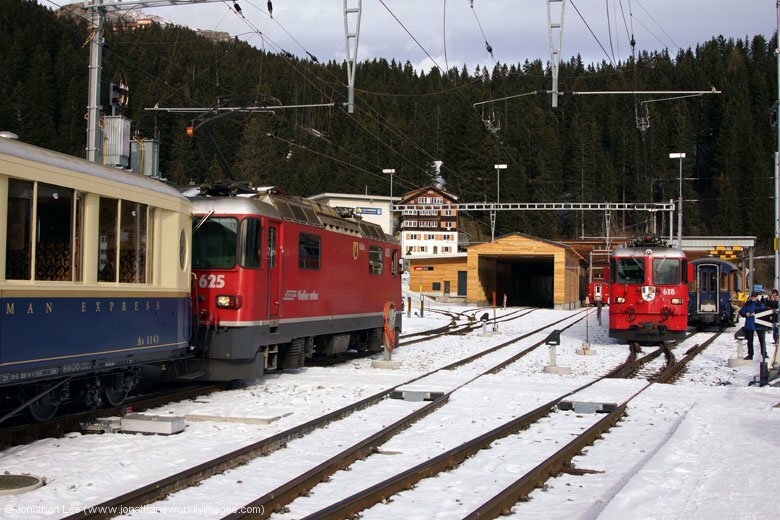 It’s a minus 3 off the St Moritz trains to the Scuol-Tarasp trains at Reichenau-Tamins, nice if they make but of course from a normal’s perspective they connect at Chur anyway. Not expecting any changes to the locos that would be used on the Arosa line trains we weren’t surprised when both Ge4/4 II #618 rolled in with the Edelweiss Express set, to form the 0935 to Arosa, and #625 was sat over the back of Chur with the Alpine Classic Pullman set, for the 1020 to Arosa. As a result I decided to spend the morning at Litziruti photographing. After a nice relaxing journey up the hill to Litziruti, where I managed to accumulate all the relevant train numbers for the weekend’s trains from the guard and confirm that the Children’s Train would be running again, I alighted into the fresh winter air and photographed #618 before it departed on its short journey forward to Arosa. The previous morning the sun had come up above the surrounding mountains; unfortunately there was no danger of that occurring on this morning as the cloud cover was just too think to even allow a glimpse! Still the snow cover at this altitude was about as good as it was going to get under the circumstances and I made my way down the tracks towards Arosa, which was actually uphill of course, to the far end of the sweeping curve and trudged about a bit while I figured out which was the best spot to photograph #625 passing through with the Pullman set. The booked service trains on the Arosa line cross at Litziruti and an opportunity to get the camera settings right came along before the Pullman set did so I was ready when it did. You can hear trains coming in both directions and from where I was stood I had a bird’s eye view of trains arriving into Litziruti and then all the way up the hill and round the curve, until they passed me and climbed away up above my head. The Alpine Classic Pullman was nowhere near as full as it had been the previous day and looked quite comfortable on board. 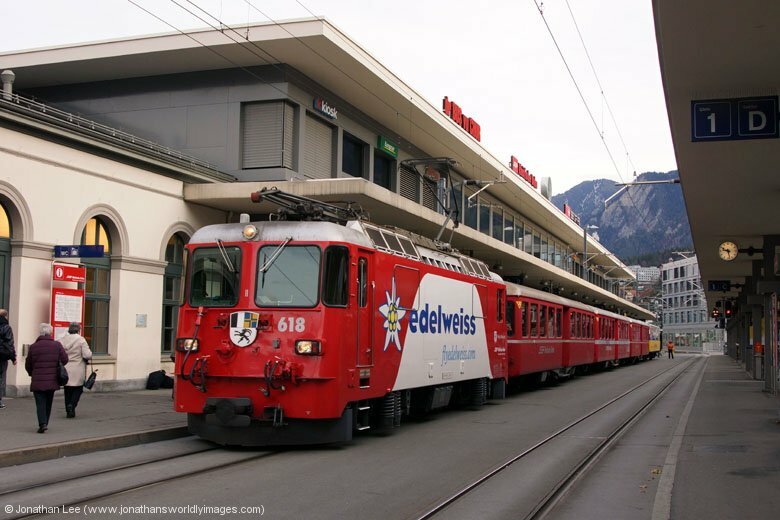 Photos taken I followed my footsteps back to the station to await #618 returning with the Edelweiss Express, 1130 Arosa – Chur, and photographed it arriving before boarding a nice warm and relatively empty train for the journey back to Chur. The on-board air stewardesses seemed in good spirits and seemed to have quite a lot of goodies to get rid of; evident by the fact I was given a handful of stuff and the fact they were throwing them across to people on adjacent trains when we crossed, as well as throwing them out to photographers as we passed by! In light of my not so productive afternoon the previous day I decided on a different tactic upon arrival back at Chur, which was to head to Sargans and do a Railjet move to Buchs and return; this move working quite nicely and is available ex Sargans on the odd hours of the day with a decent but not too long a plus at Buchs. 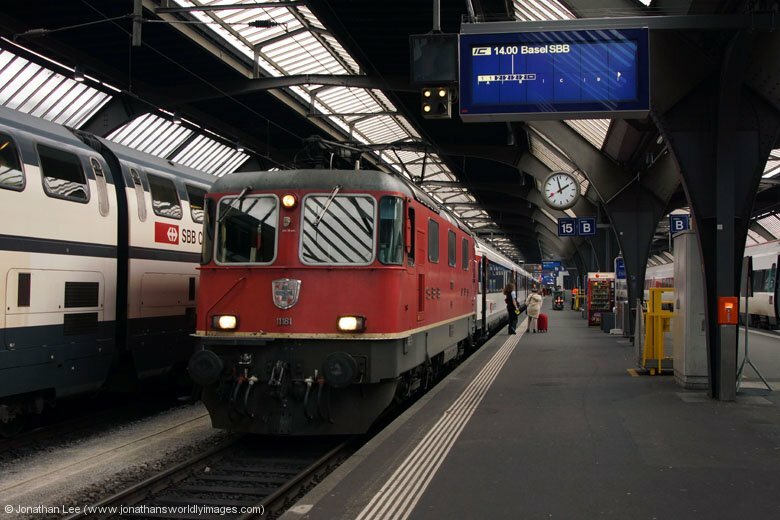 Ironically I made the small plus onto the 1239 Chur – Zurich HB, unlike the previous day, which of course was now a minute later than the previous day with the timetable change, but it was dud so I flagged it in favour of the 1309 Basel which was surprisingly new 460027. As 460027 paused at Landquart on the way to Basel I spotted RhB Ge4/4 I #610 sat with the old green set, in the same place it had been the previous day; obviously ready to work ecs to Chur again. The set wasn’t there when I returned from Sargans so I can only assume it did what it was expected to do. The Railjet move to Buchs worked like clockwork and neither train was anywhere near full. 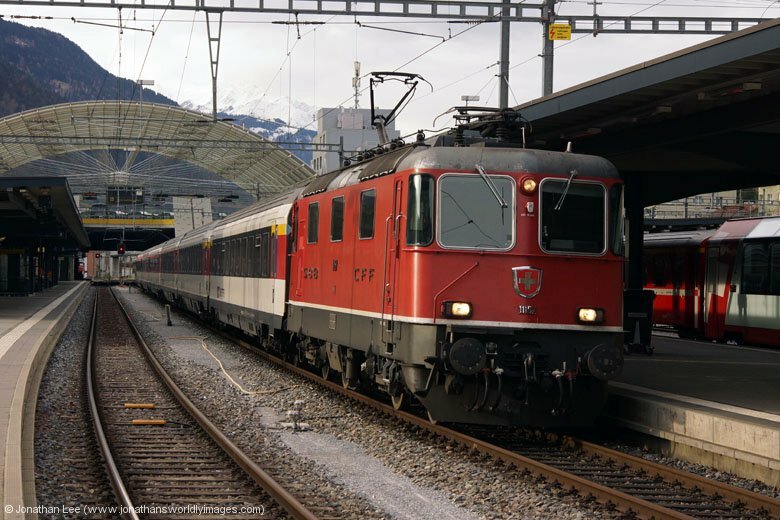 OBB 1116221 worked RJ167 1240 Zurich HB – Wien Westbahnhof. During the stop at Buchs I thought I’d watched someone trying to avoid paying as they got out of the side door of the engine and walk down the platform; it turned out to be a member of train crew in a rather non-existent uniform who was changing ends during the train’s reversal there! 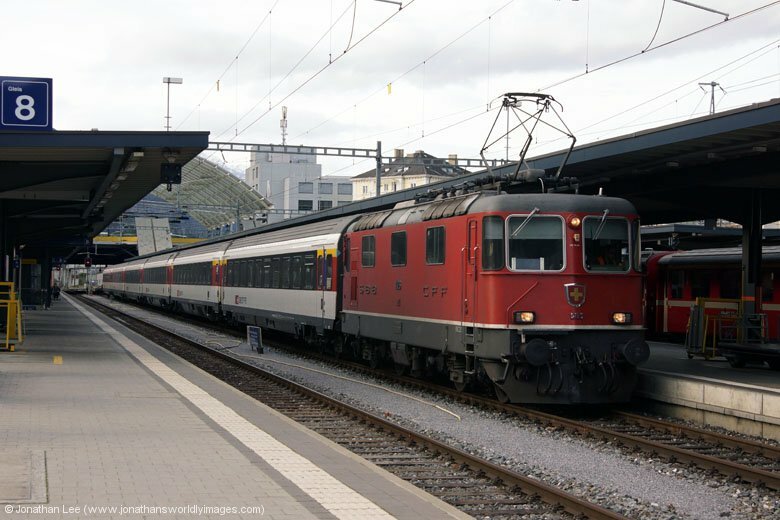 As short wait later OBB 1116213 arrived with RJ160 0730 Wien Westbahnhof – Zurich HB, the loco being the wrong way round on the set so the continuous stripe down the set was broken at the end of the stock. 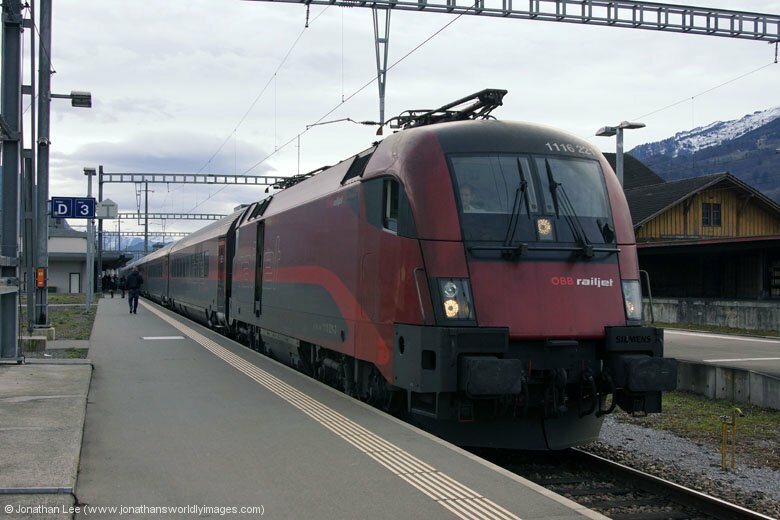 The idea of the afternoon was to cover RhB’s RE1351 1521 Landquart – St Moritz which was showing in the new diagrams as booked for a Ge 6/6 II and with a bit of time to kill I just did a couple of moves between Sargans & Landquart to pass it. 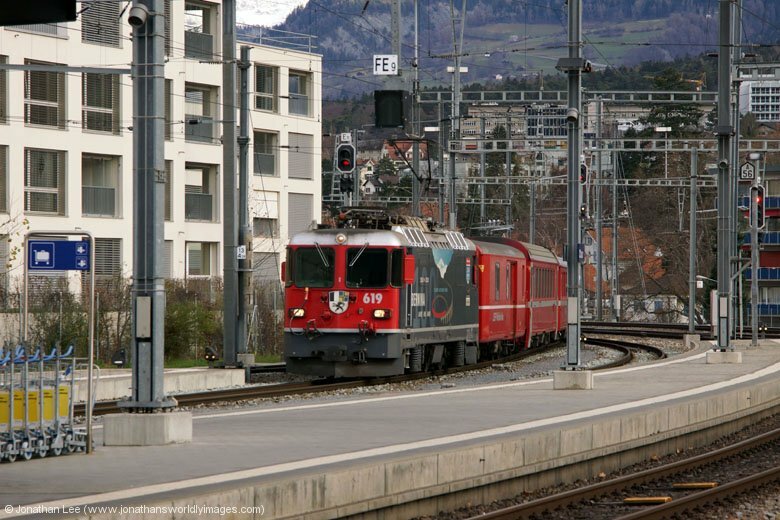 During that time I had SBB Re4/4 11136 on IC928 1439 Chur – Zurich HB; I’d seen this turn on three consecutive days with 11134, 11135 & 11136, in that order. When the time came I met up with Tohm again at Landquart, who’d done the Pullman up to Arosa and return. 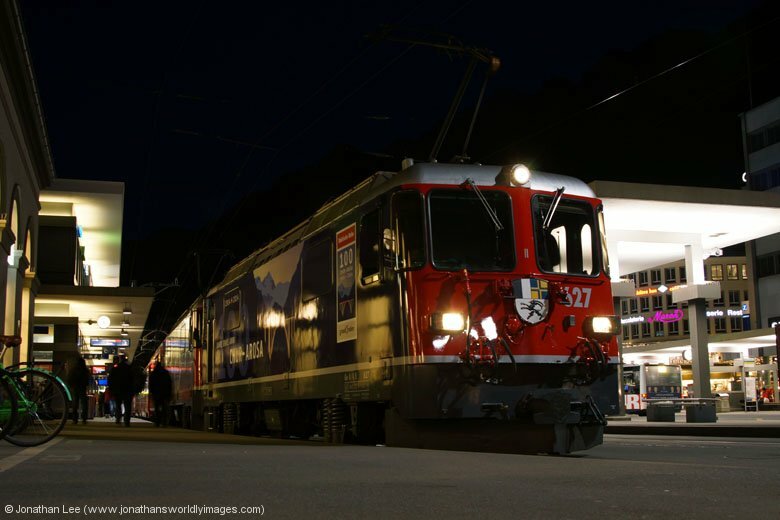 It didn’t take long to figure out that RE1351 1521 Landquart – St Moritz wasn’t going to be a Ge6/6 II and sure enough Ge4/4 II #612 dropped into the platform with the set shortly before booked departure time, having been sat just outside in the yard with its headlights on. 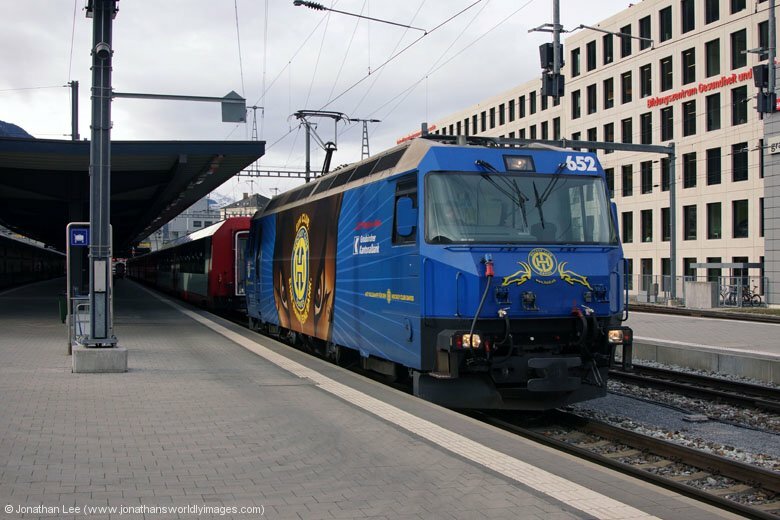 We still did it to Kublis anyway and broke the return journey up by dropping back to Schiers with Ge4/4 III #646 on RE1048 1502 Davos – Landquart for Ge4/4 II #626 forward to Landquart on RE1350 1437 St Moritz – Landquart. 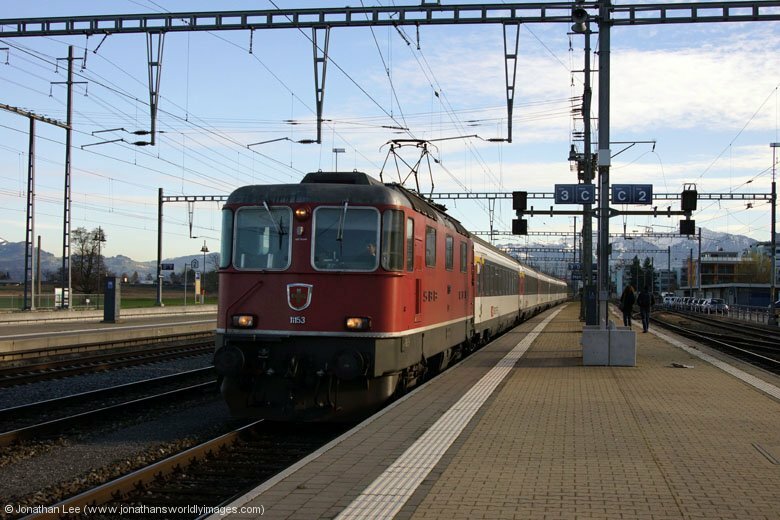 It was at this point where Tohm had to head back to Vevey, we both did IC932 1638 Chur – Zurich HB north with me alighting at Sargans to see what the late afternoon would offer up. Re4/4 11155 was the next engine to turn up heading toward Chur with IC929 1607 Zurich HB – Chur. 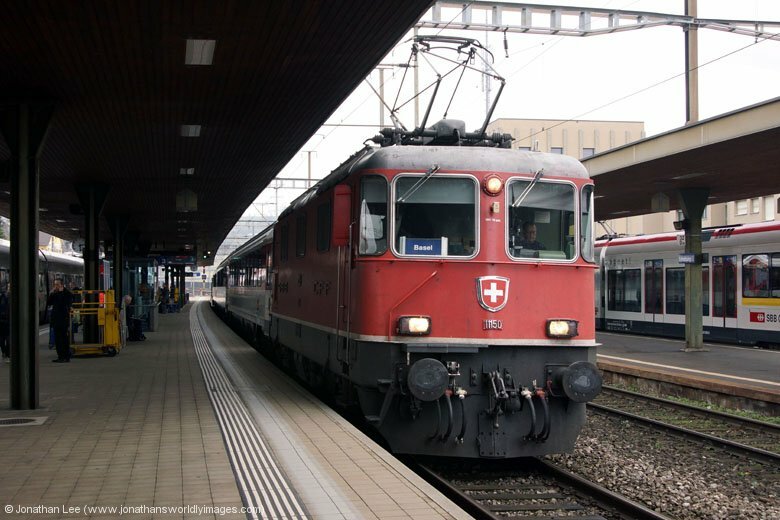 It seemed that the Zurich – Chur trains that were conventional sets, not push-pull, generally seemed to be Re4/4. This must have been a diagram change in the summer 2014 timetable? We’d have to see if they remained booked turns when someone was kind enough to release the diagrams. Having managed to get one new Re460 in I headed back to Schiers in the early evening to cover one of the RhB Ge4/4 II turns that I’d not seen that day; hoping it would produce #628 which was now my last Ge4/4 II. 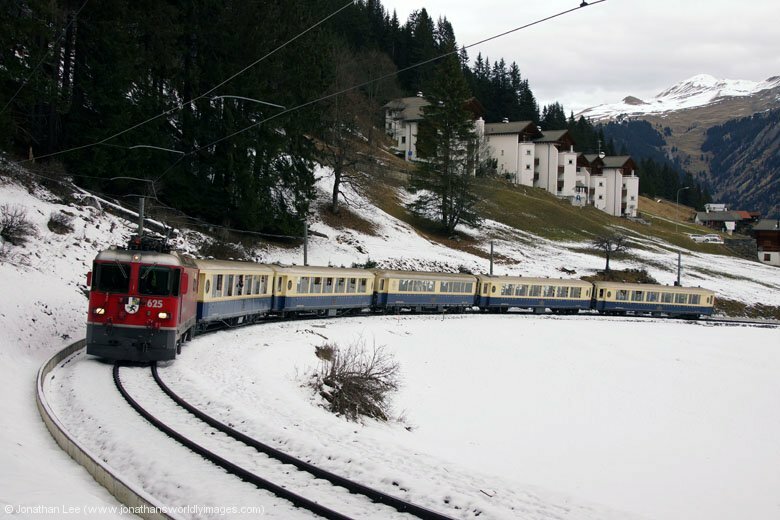 Having done #614 out on RE1261 1544 Disentis – Scuol-Tarasp I was gifted with #613 on RE1358 1646 St Moritz – Landquart so no luck on the clearing up front. Having not seen #628 at all during the weekend I suspected it was tucked away inside Landquart shed; hopefully not demic. SBB 460027 delivered me back to Chur on IC579 1633 Basel – Chur where I managed to get a table in the Pizzeria quite easily that night, for some much needed proper food. Back at the hotel it was packing night as I’d be out early the following morning to cover the Ge6/6 II turn on 4221 0753 Ilanz – Chur mixed train. I made sure I had plenty of time to sort my bill out and get breakfast before heading to the station to do one of the same trains I’d done during the previous two mornings, on this occasion though it would only be to Domat/Ems and not from Reichenau-Tamins. 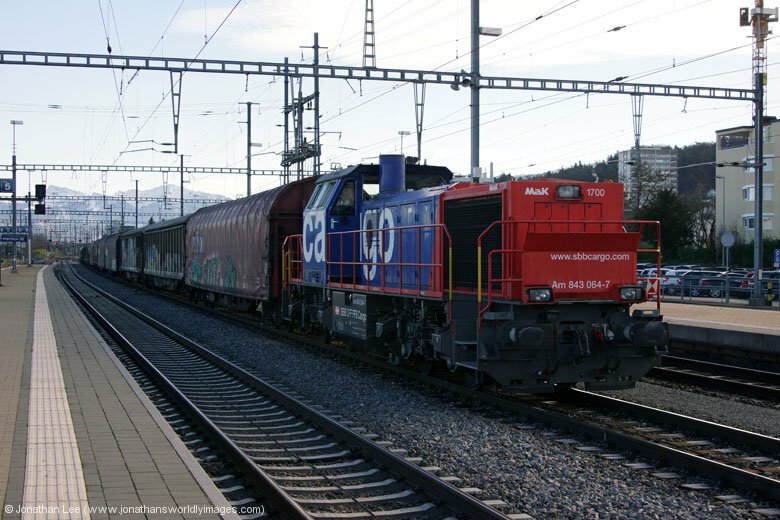 RhB Ge4/4 III #651 headed RE1121 0758 Chur – St Moritz and the short wait at Domat/Ems revealed RhB Ge6/6 II #706 with 4221 0753 Ilanz – Chur. Of the six times I’d covered the train this was the first time it had been a dud Ge6/6 II, which isn’t a bad ratio with only 7 locos! This occasion did have its differences though as it was the biggest train I’d seen on this turn with 3 coaches, vice the usual two, and 8 loaded container wagons. The front coach was a first class coach too, which I chose to frequent assuming there was no first class booked on the train; as I didn’t get gripped that discussion never had to take place. 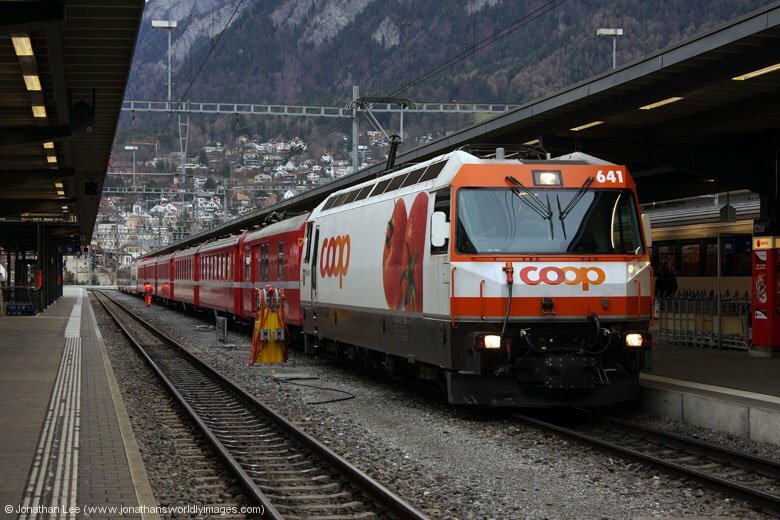 With no real plan to get to Zurich a plan soon presented itself back at Chur as RhB Ge4/4 III #641, in Co-Op livery, was sat waiting with RE1125 0858 Chur – St Moritz; this being my last Ge4/4 III. It had been the Ge4/4 III involved in the derailment earlier in the year and I’d assumed it remained out of service as I’d not seen it; it would have been rude not to do it so off to Thusis I went for #652 back on RE1124 0802 St Moritz – Chur. 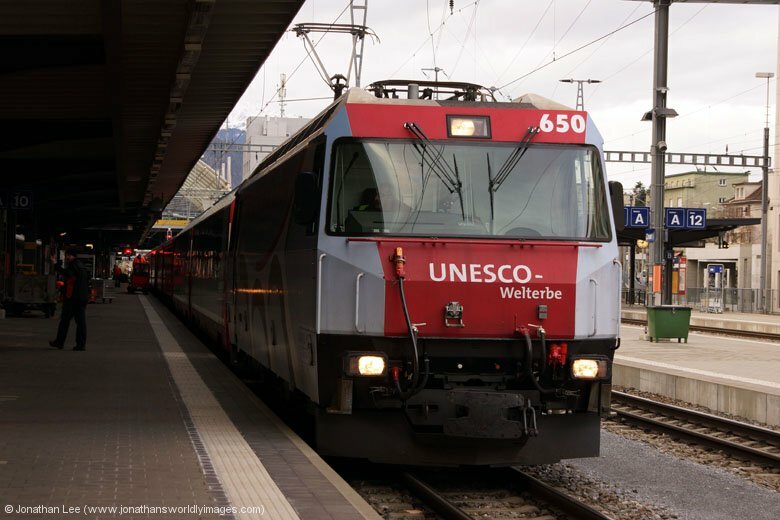 My journey to Zurich was on board IC920 1039 Chur – Zurich HB, the loco and stock of which were off IC913 0807 Zurich HB – Chur, the latter being booked an Re4/4 of course; and this day certainly didn’t disappoint as new Re4/4 11157 was sat waiting to draw into the platform after the 1009 towards Zurich had departed. Upon arrival at Zurich I watched Re4/4 11121 arrive with IR2418 0847 Locarno – Zurich and then walked down to the opposite end of the stock to watch Re4/4 11127 drop onto the set to work IR2421 1209 Zurich HB – Locarno; which I did out to Arth Goldau to cover IR2422 1047 Locarno – Zurich HB, which I was hoping would also still be booked for an Re4/4 since the timetable change. 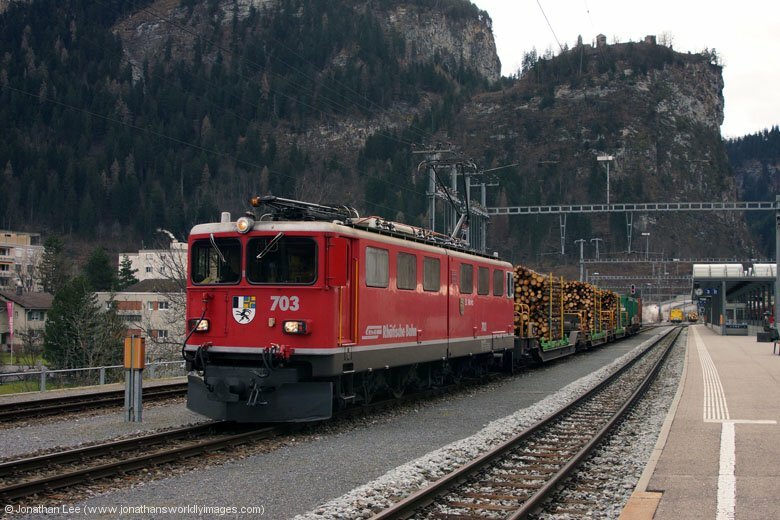 While at Arth Goldau I spotted VAE2577 1240 Luzern – St Gallen with SOB 456094/092, there were also a couple of freights about with mixed Re4/4 / Re6/6 combinations Gotthard Pass bound. Thankfully IR2421 arrived with Re4/4 11127 which I did straight back to Zurich HB to find Re4/4 11181 with IC774 1400 Zurich HB – Basel and Re4/4 11150 with IR2274 1408 Zurich HB – Basel; it seemed that the timetable change had brought back Re4/4 turns on the Zurich – Basel circuit? I opted for 11150 out to Lenzburg for the plus 2 for the opposing working straight back; this is where my move started to go downhill. With the only thing in the distance being an approaching ICN set I decided I had plenty of time for a photo before 11150 departed but when the ICN set came to a stand in the platform and people started to board I became a little confused as the screens clearly displayed the 1430 departure for Zurich HB and it was showing as an IR train in the new timetable; this turned out to be my first ICN set in Switzerland! Bowled by and ICN set on an IR turn I had no real choice but to do it back into Zurich HB, unless I fancied a 30 minute fester for what would be an EMU anyway on the next train into Zurich! As all the Re460’s on the blocks at Zurich HB were dud when I got there I decided it was time to see if I could pick up and Re450’s downstairs and cover the Lion Re420 commuter turns in the process. As I’d had such a good run with the Re450’s in the summer new ones were few and far between and I only managed to pick up 6 in two hours but I did pick up two Lion Re420’s, from 4 turns, in the process. Having done Re420’s 420225/221 from Hardbrucke on 19163 1600 Hardbrucke – Schaffhausen I managed a quick out and back to Hardbrucke again before being faced with a decision as to whether to wait for 19165 1630 Hardbrucke – Wil or head over to platform 31 to see what was on IR2229 1642 Zurich HB – Luzern via Zurich Enge. In the end I dashed over to platform 31 in the hope the set would be in early enough to allow me to get back to the low level platforms to cover 19165 if need be. Re4/4 11147 was just rolling in with the ecs when I got there and was detached from the rear of the set by the time I’d scurried down the platform and back, discovering Re4/4 11128 at the head of RE2229. I was back on the low level platforms with plenty of time to do Lion Re420’s 420202/205 on 19165, the former of which was a new one for me. With not much time to get to Hardbrucke to cover 19167 1700 Hardbrucke – Schaffhausen I had to do what turned up and with a choice of two trains I did the first to Zurich HB LL for the second forward to Hardbrucke where a nice cross platform plus not a lot made on the higher level platforms with ease. The bonus being that it ended up being an Re420 for Re420 move. Lion 420216/222 surprised me with 18066 1651 Stadelhofen – Bulach, a turn not previously mentioned in any Lion Re420 diagrams so whether it was a new one since the timetable change would remain to be seen of course. 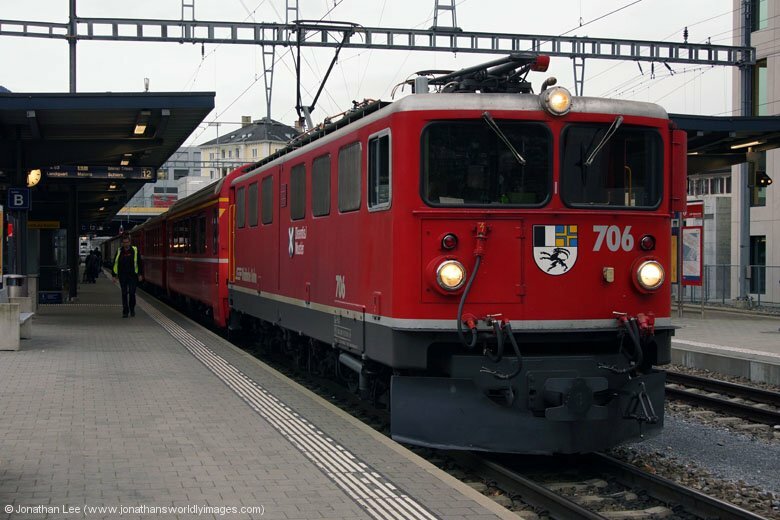 Re420’s 420218/217, the latter being new, ended my afternoon’s downstairs bash nicely with 19167 1700 Hardbrucke – Schaffhausen and I headed back upstairs for my favourite train of the Zurich evening rush to the airport for my 1910 flight back to London City. What had been IR3831 1733 Zurich HB – St Gallen for a few years had become IR2201 in the new timetable and the expected pair of Re4/4’s were nowhere to be seen, instead I was gifted 460087 instead; this proving that diagrams do change for the worst. I actually had a choice of three trains to the airport at that point yet the other two were both late so I ended up having to do a dud 460087 to the airport anyway. An unfortunate end to a decent 4 days; little had I realised when I’d seen Re4/4’s 11124/11127 on IR3831 1733 Zurich HB – St Gallen on the previous Friday that it would be the last time said train would be a pair of Re4/4’s. The flight back was on time and I was on the 2043 Euston – Wolves to Milton Keynes, thanks to the Docklands display screen in the airport telling me I either had 1 minute or 11 minutes to wait for a train so I got a bit of a shift on and made the first one by a few seconds. 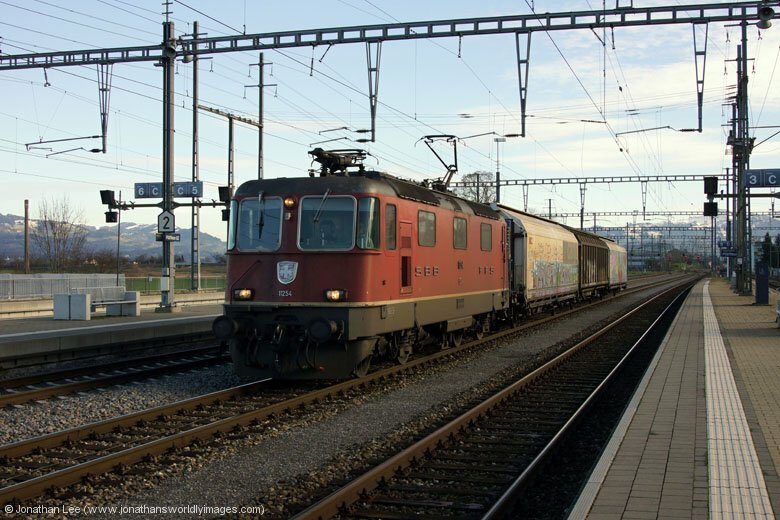 500032 Lenzburg Zurich HB 1347 Basel – Zurich HB IR2273 SBB ICN vice conventional hauled??? For a last minute trip, thrown together on a whim, it was a good one and achieved what it needed to. Of course diagram changes from one timetable to the next can throw a spanner in the works but I can’t really complain. 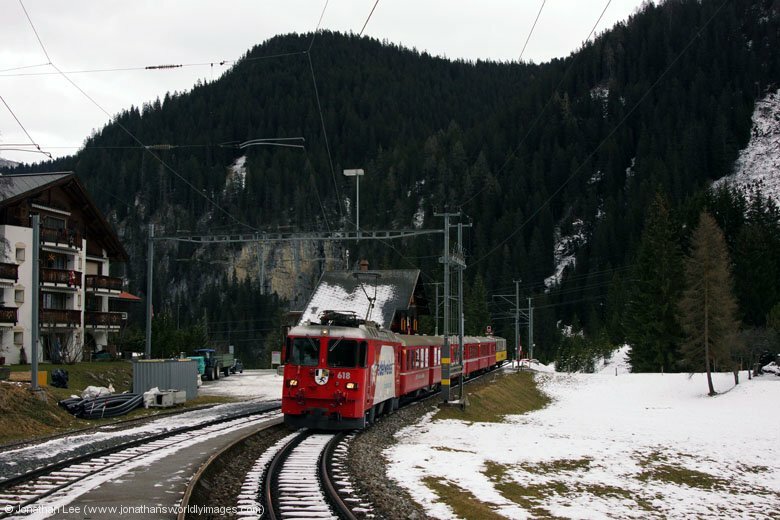 I have to say I was slightly disappointed with what RhB turned out for the Arosa line celebrations and had expected some freight engines at the very least; and not on trains that weren’t accessible to the general public either, as in Ge4/4 I #610’s case. I hadn’t realised when I’d headed out that the RhB heritage fleets could no longer work on the Arosa line so I guess if I’d known that beforehand my expectations would have been a bit less. 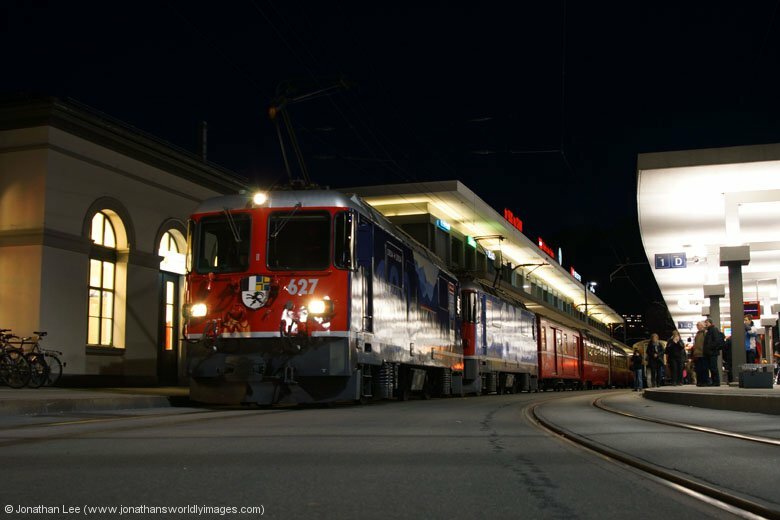 Either way, being a newbie to Switzerland really, I was pleased to get Arosa in for loco-hauled and as always in Switzerland the event was well planned and well executed; from what I saw anyway.